As this blog goes live, I'm getting ready for Gabrielle and Rich's wedding day in Rincon, Puerto Rico! Since the day is finally here, as usual, here's a short and sweet blog about their beautiful engagement session. 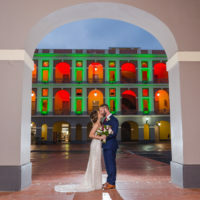 Gabrielle and Rich opted to have their wedding on the picturesque west side of Puerto Rico, so during their wedding planning trip, we scheduled their engagement photos session. Based on their questions and requests, I knew they didn't want a cookie-cutter or 'touristy' portrait session. So I looked for different engagement photos session locations than what I'm used to. After discussing different options, I suggested a secret beach in Aguadilla that had quite an exotic and intimate appearance, as the trek to it makes it not that accessible for regular beachgoers. Sadly, on their engagement photos session day, it was pouring rain. I drove west, hoping we could get at least 45 minutes of no rain. But, when we got there, the skies were gray. I set up a plan B and plan C, in case the rain didn't allow us to continue. Luckily, plan B worked out for just enough time to have a lot of fun during their engagement photo session, and we get to know each other. A few minutes after we ended the portraits, it started raining, so I drove back home feeling happy and fortunate that everything went well and we ended up with this gorgeous set I'm happy to share today.